I080P FULL HD DASH CAM with Smart enabled [Radar Alerts Record your ride Records the road ahead in 1080P Full Embeds exact location and time into video recordings. 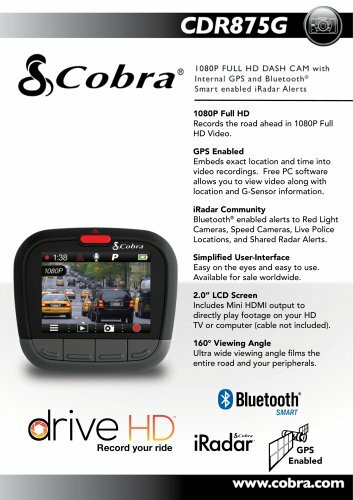 Free PC software allows you to view video along with location and G-Sensor information. iRadar Community Bluetooth® enabled alerts to Red Light Cameras, Speed Cameras, Live Police Locations, and Shared Radar Alerts. Simplified User-Interface Easy on the eyes and easy to use. Available for sale worldwide. Includes Mini HDMI output to directly play footage on your HD TV or computer (cable not included). Ultra wide viewing angle films the entire road and your peripherals.